About:- Small House plan with interior designing. Floor plan drawing, office plan, Elevations, . Just forward us your site area dimension or your idea sketch or reference image and you functional needs. 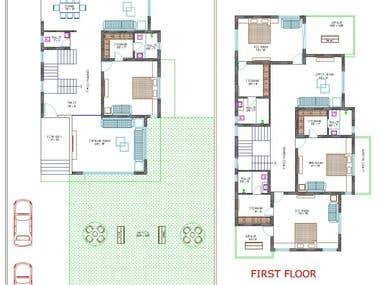 We Can Produce:- 2D Floor Plan Layout, Furniture Layout, Working Drawing. Interior Designing for Bedroom, Kitchen, Bathroom, Living area & All Design in home. Create electric plan, plumbing plan, ceiling plan. Colorful floor plan with layer detail, plan presentation. Many more things i can do on CAD. Will be happy to help.